* Book the picking up car/bus before coming to Vietnam. Take a taxi from the air port to your hotel is not so good ideal because firstly the price is not cheaper than a comfortable car or bus you book in advance, secondly, some taxi in Vietnam is not reliable. * Taking over big buses or trucks on the right hand when riding a motorbike is sometimes better and safe than doing on the left hand. * Use as much of horn as possible any time you want to take over any scooters, motorbikes or buses in Vietnam because simply it’s custom of riding and driving in Vietnam. The Vietnamese riders and drivers don’t usually look at the mirror and they only leave the way for you when you hear your horn. * Store your cash, credit cards, airline tickets and other valuables in a safe place. Most 4-star hotels have in-room safes, otherwise ask the reception to keep your valuable things in their deposit facility. * Take a hotel business card from the reception desk before venturing out from your hotel. This will make your return to the hotel in a taxi or cyclo much easier. * Dress appropriately. Not only for the prevailing weather, but also not to cause offence to the local people. Vietnamese have conservative dress codes, and it is only in larger cities that these codes are a little more relaxed. Do not wear revealing clothing. * Ask for permission when taking a photograph of someone. If they indicate that they do not want you to, then abide by their wishes. DO NOT offer money or push the issue. * Drink plenty of bottled water. During the summer months you should be drinking a minimum of two liters per day. If you drink tea, coffee & alcohol you should increase you water intake accordingly as these will help to dehydrate you. (2) It is more likely that you may become a victim of a pickpocket or drive-by bag snatcher. * Don’t be paranoid about your security, just be aware of your surroundings. * Don’t wear singlets, shorts, dresses or skirts, or tops with low-neck lines and bare shoulders to Temples and Pagodas. To do this is considered extremely rude and offensive. * Avoid giving empty water bottles, sweets and candies or pens to the local people when trekking through ethnic minority villages. You cannot guarantee that the empty bottles will be disposed of in a correct manner, and the people have no access to dental health. If you want to give pens, ask your guide to introduce you to the local teacher and donate them to the whole community. * Never sleep or sit with the soles of your feet pointing towards the family altar when in someone’s house. * Never lose your temper in public or when bargaining for a purchase. This is considered a serious loss of face for both parties. Always maintain a cool and happy demeanor and you will be reciprocated with the same. * Do not try to take photographs of military installations or anything to do with the military. This can be seen as a breach of national security. * Never take video cameras into the ethnic minority villages. They are considered to be too intrusive by the local people. * During the motorbike touring in Vietnam, It is sometime necessary to take over the trucks or buses on the right hand side, but DON”T do that with another motorbikes or scooters. Just press horn to let them know you are coming and they ( motorbikes/scooters) will turn closer to the right side of the road and then you can take over them easily from the left. 2. 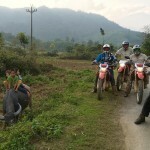 How to have safe motorbike ride in Vietnam. 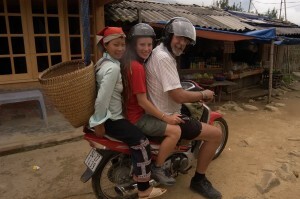 If you take a guided motorbike tour from us, a Vietnamese motorbike expert will be your tour guide. He will be 4 in one( leader/translator/mechanic/teacher of riding). Your guide leads you and he will give you hand/body language or any special signal to let you know if the danger is in front such as: big pot holes, big trucks coming, blind curves, slippery road or any thing may causes danger for you. So just slow down your speed or stop for safety if you get any signal from your guide. Vietnam’s climate varies considerably from region to region. Although the entire country lies in the tropics and subtropics, local condition varies from frosty winters in the far northern hill to year-round, subequatorial warmth in the Mekong Delta. Climate of Vietnam is indicated by two monsoons. The winter monsoon comes from the northeast between October and March, bringing wet cold winter to all areas north of Nha Trang, and dry and warm temperatures to the south. From April or May to October, the southwestern monsoon bring warm, humid weather to the whole country except for those areas sheltered by mountains. * For the best balance, Come and ride in : February, March, April, May or October; November, December. * From July to November, violent and unpredictable typhoons hit central and northern Vietnam. It gets pretty crowded from November to March and in June and August. So if you don’t fancy sharing the sites with the masses, try to avoid these busy times. Some travellers like to time a visit with Tet (Vietnamese New Year), which is the biggest festival in the calendar in late January or early February. A nice idea but not ideal, as the whole country is on the move. Price of everything could be as twice expensive as in normal times. Eating in Vietnam ranges from cheap noodle soups on the street for about 1 USD to a banquet in one of the luxury hotels. Vietnamese restaurants offer a broad selection of international fare including French, Italian, American, Indian, Chinese and Japanese. The most typical Vietnamese food is Pho, the noodle soup with meat in it. It is very cheap and usually well spiced. The main types are: Pho Bo with beef, Pho Bo Tai with rare beef fillets and Pho Ga with chicken. Com – steamed white rice is eaten for lunch and dinner. Nuoc Mam is the fermented fish sauce used to spice absolutely everything in Vietnam. Seasonal fruits such as dragon fruit, rambutans and longans, fresh vegetables and local seafood are widely available, although supply can vary by region and season. All fruits and vegetables should be cooked or peeled before eaten. Drinking water or ice is not generally recommended, even in the cities. Bottled water is cheap and readily available, so we recommend you don’t take the risk. Besides beer, Vietnam is also a place to enjoy tea (Thai Nguyen tea or “Thai tea”), coffee (Trung Nguyen coffee) or something heavier, wine (Nep Moi – the Vietnamese whisky). 5. Vietnamese Currency – Vietnam Dong (VND). The currency of Vietnam is “Dong” (VND). Bank notes are: 100d , 200d and 500d (too small value – rarely used); 1,000d; 2,000d; 5,000d; 10,000d, 20,000d, 50,000d, 100,000d and 500,000d (cotton and polymer), 200,000d and 500,000d. Coins have recently come into circulation but not widely been accepted due to inconvenience, including: 200d; 500d; 1,000d; 2,000d and 5,000d. US dollar is widely accepted while most major currencies can be exchanged at leading banks in Vietnam (Vietcombank, ANZ, ACB, VIB Bank…) or some hotels and jewelry shops. The official rate of exchange is approximately VND 21,000 to USD 1( Dec, 2012). With the relatively low value of Dong, you are recommended to carry US dollar in small notes; it will help you to change easily. ATMs can be a choice as it’s very popular in most of tourist destinations now. Vietcombank (VCB) has the best network in the country. Withdrawals are issued in Dong (50,000d and 100,000d only). There is a limit of 2,000,000d (about US$100) for each withdrawal and a daily limit of 20,000,000d. Fee is 60,000d (US$3) each time. Visa, MasterCard and JCB cards are widely accepted. Some merchants also accept Amex. A 3%-commission charge on every transaction (3% for other cards) is pretty common, due to bank’s policy. Getting cash in advance from cards is possible at Vietcombank and some foreign banks in Hanoi and Ho Chi Minh City. Travellers Cheques are accepted at most of hotels, restaurants but in major cities. If you only have travellers cheques, stock up on US dollars at a bank, which usually charge anywhere from 1.25% to 3% commission to change them into cash. VCB charges no commission to changing travellers cheques for Dong. If your travellers cheques are in currencies other than US dollars, they may be useless beyond the major cities. Hefty commissions are the norm it they can be exchanged at all. 6. Health Care in Vietnam. Travellers tend to worry about contracting infectious diseases when in the tropics, but infections are a rare cause of serious illness or death in travellers. Pre-existing medical conditions such as heart disease, account for most life-threatening problems. Becoming ill in some way, however, is a relatively common thing. Fortunately, most common illnesses can either be prevented with some common-sense behaviour or be treated easily with a well-stocked traveller’s medical kit. Health issue and the quality of medical facilities vary enormously depending on where and how you travel in Vietnam. Many of the major cities are now very well developed, although travel to rural areas can expose you to a variety of health risks and inadequate medical care; However, traffic in Vietnam gets better and better quickly so It dose not take long time to go from remote area to big cities – Hanoi or Ho Chi Minh. Unit 109-112, Van Phuc, Blog A1, Kim Ma Str. 31 Hai Ba Trung Str. 12 Chu Van An Str. No matter which way of access you choose, a Vietnamese entry visa is required for all foreigners, except for citizens of countries having bilateral agreements on visa exemption with Vietnam. No fees unless otherwise agreed upon between Vietnam and applicant’s country. On applying this visa, you must submit an official letter from the concerned agencies of local government, foreign embassies or consulates accredited to the country, international organizations, or other accredited organizations based in that country. On applying this visa, you should obtain an approval through your sponsor in Vietnam. It’s generally much easier to apply once in Vietnam. Multiple entry and stay of three-month or six-month is possible. It’s what you need to enter Vietnam! Available one-month single-entry visa (maximum). Tourist visa may be extended one time for 30 days after your arrival in Vietnam. If you plan to spend more than a month in Vietnam, or if you plan to exit Vietnam and re-enter from Cambodia, Laos or China, you will need a three-month multiple-entry visa with the approval from local agents. You can either apply yourself at Vietnamese embassy or consulates in your country or have a local travel agent (your sponsor) to do a part or full its procedure. You will receive a Vietnam IMMIGRATION /CUSTOMS form from the flight attendant. This is fairly self explanatory. DO NOT leave any blanks unless the question doesn’t apply to you. If you have any questions ask a fellow traveler or flight attendant. The last thing you want to do is get to the Vietnam immigration desk with an incomplete form. The official will probably have limited English language ability and there likely be a long line of travelers behind you. You don’t want to spend any more time at the desk than absolutely necessary. When you get off the plane you will proceed to the immigration line. Be sure to get in the tourist line. Get your passport and other documents ready. The Vietnam immigration officer will compare the visa stamped in your passport and the visa entered in the immigration information system. If you get a pre-approved visa from a service agency the procedure will be the same. He will stamp the visa in your passport and give you a white immigration card. This card is your official Vietnam travel/tourist permit. DO NOT LOSE THIS FORM! You must turn in this form when you leave the country.